The new Hybrid 3 speed air movers from Powr-Flite combine the increased drying power of an axial fan with the desired features of a squirrel cage design. These are stackable, lightweight, powerful air movers that are built to last, with a molded co-polymer polypropylene housing to withstand the daily punishment encountered in the contract cleaning, restoration, floor care or painting business. 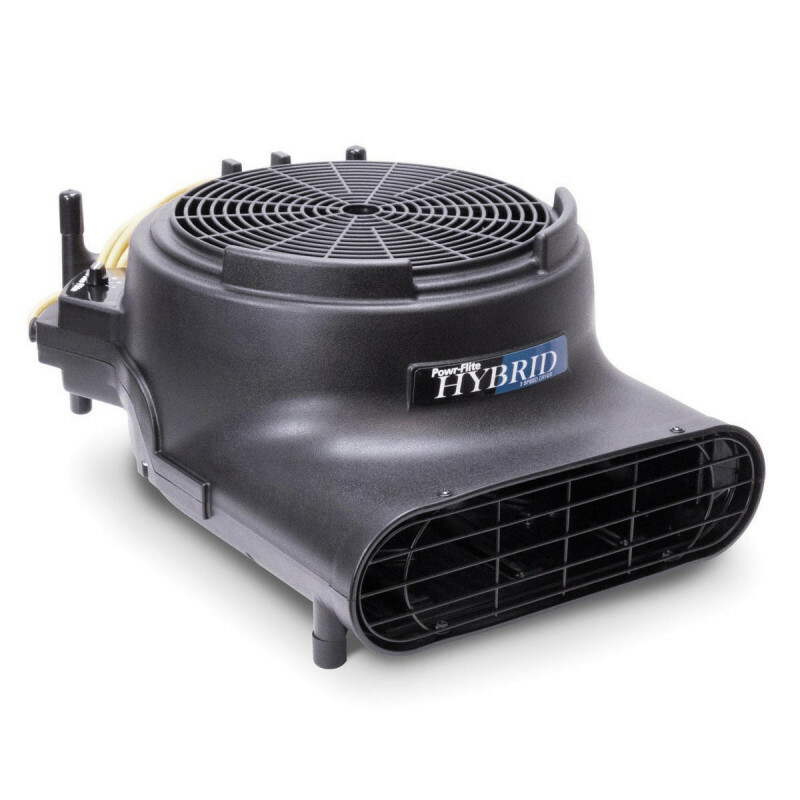 This Hybrid design increases airflow by providing an air velocity of 3,400 feet per minute and weighs 45% less than a typical blower. The 11.5 inch height and the decreased weight make this hybrid air mover easier to transport and store. These will become your go-to machines for all your surface drying needs. Powr-Flite offers you two light-weight and versatile options. The PDH1 offers stacking, 3 speeds and 2 operating positions. The Deluxe model PDH2 offers all of these options, but also includes a kickstand and side shoe to allow for operation in 4 different positions. You further gain the ability to daisy chain up to 4 hybrids on one 15 amp circuit. For more options please take a look at our full line of carpet dryers. Powr-Flite thought they would test the hybrid machine in some very unusual, and abusive conditions. The video below truly conveys the durability of this Hybrid Air Mover. 2 operating positions on the standard unit and 4 on the Deluxe model. Lightweight 17.5 pound operating weight on the standard and 18 pounds on the Deluxe. 3,400 FPM air velocity on both units. Daisy chain up to 4 units of the Deluxe model. Low profile measures only 11.5 inches high. Both units built with stackable, space-saving design. Customers who were interested in the Powr-Flite® Hybrid Carpet & Floor Dryer were also interested in the following items. This is a review for the Powr-Flite® Hybrid Carpet & Floor Dryer.